To show the efficacy of mirabegron for medical expulsive treatment, in patients had intramural located distal ureteral stone. 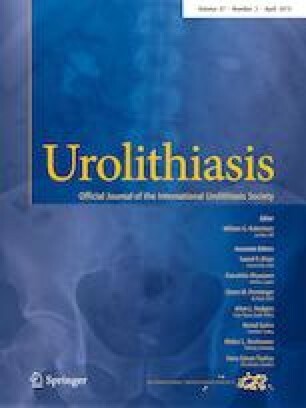 A 80 patients had intramural ureteral stone were assessed retrospectively between April 2017 and January 2018. Mirabegron 50 mg/day + diclofenac 100 mg/day (group 1, n = 40), and only diclofenac 100 mg/day (group 2, n = 40) were administered to patients, consecutively. Age, gender, stone size, laterality, and severity of hydronephrosis were recorded. Spontaneous stone expulsion rates (SER), stone expulsion time, and the number of daily colic episodes were evaluated. In the group 1, one (2.5%) patient was excluded due to nasopharyngitis, and one (2.5%) patient was excluded due to 5 mmHg systolic blood pressure increase. In addition, four (10%) patients in group 1, and six (15%) patients in group 2, who did not attend follow-up examinations, were excluded from the study. There was not any statistically significant difference between the two groups in terms of age, gender, stone location, severity of hydronephrosis, stone size (p = 0.736, p = 0.310, p = 0.467, p = 0.801, p = 0.761, consecutively). Spontaneous expulsion ratios were calculated as 73.52% in group 1, and 47.05% in group 2 (p = 0.026). However, there was not any statistically significant difference in terms of stone expulsion time (p = 0.979). SER for patients had ≤ 6 mm stones was higher in group 1 (87.5 vs 52.49%, p = 0.031). In addition, group 2 patients had more pain episodes (1.02 ± 0.52 vs. 1.29 ± 0.57, p = 0.049). In the current study, mirabegron has been shown to be an efficient, safe and a new treatment modality, with lower side effect profile for the intramural located distal ureteral stones. Mehmet Solakhan, Omer Bayrak and Ersan Bulut each declare no potential conflicts of interest.